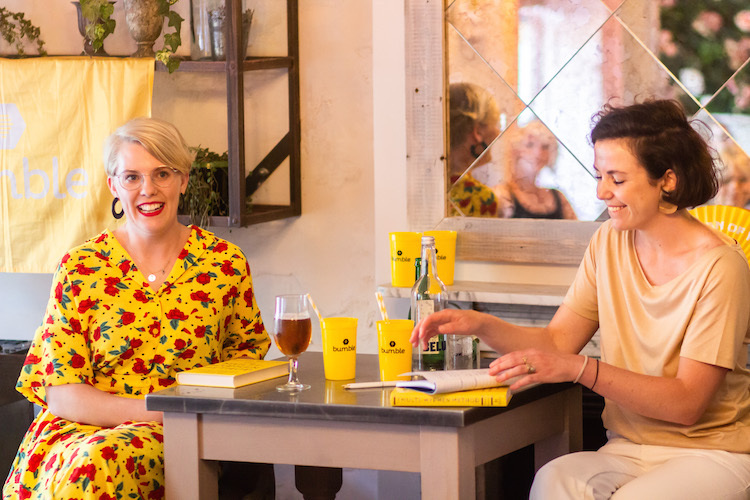 The Bumble Bizz x Emma Gannon regional book tour recently came to an end, celebrating the release of The Multi-Hyphen Method. Together, we spent a few weeks travelling across the UK to dole out tips and insights on how to live the multi-hyphenate life. During the hectic tour, we were sure to find time with Emma to learn how she came to be a multi-hyphenate herself, the book writing process, and how she likes to make the first move on Bumble Bizz! Bumble is all about making the first move, so what exactly motivated you to make the big leap from full-time to freelance? It was a transition. I don’t agree with those self-help business books that tell people to just quit their job and just go and "do what you love"overnight — it’s such bizarre advice! No one should make a rash decision without some element of planning. My blog, which I always had alongside my job, started to gain popularity after a few years of doing it. Brands started to approach me and also consultancy requests. I knew I needed some element of flexible working to make my blog and job both work, so I asked for one day off a week. I think British people in general find it hard or awkward to ask for things, but it proved to me that asking can pay off. So my first move was asking to go down to four days a week. After a year or so, I gained the confidence to go out on my own. What inspired you to write The Multi-Hyphen Method? I think it was my own awkwardness around my career path. I was doing all these cool things but I wasn’t owning it. I would clam up and get embarrassed about my career path. I couldn’t answer the "What do you do?" question very easily, because I didn't have one job. My multi-hyphenate lifestyle was earning me more money than my old salary, and I was enjoying it more — but I still felt this stigma of the Jack of all trades looming. So I wanted to write a book that validated the movement and spread the message that being a multi-hyphenate is actually pretty darn cool and will help you get ahead when it comes to the future of work. It's all about up-skilling and continuous learning. How do you find balance when juggling multiple professions at the same time? Of course it’s possible to get easily overwhelmed with multiple projects, but being a multi-hyphenate isn’t about taking on 17 different jobs and keeling over with business! It's about the opposite. It’s about streamlining your workload, working on projects in strategic ways, and setting boundaries over your time and energy. If it means blocking out a day of free time just so nothing else gets booked in, so be it! I’ve learned the power of saying no and how to charge correctly for my time. The book is full of advice on how to juggle multiple projects without burning out. What are your top tips for young women looking to becomes multi-hyphenates? Self-promote in a way that feels good and not icky! Know when to say yes to things and when to turn them down — which takes time to figure out your own ratio. Fine-tune your elevator pitch so that you can sum up your different moving parts. Play close attention to your finances and multiple income streams so you are on top of what's coming in and going out. Then get out and about! Just because you don’t work in one office doesn’t mean you can’t be social. Co-working spaces or regular meetups are great so that you are professionally socialising in a natural way. And what about making connections as a freelancer? Go into every conversation without an agenda. Don’t think of it as networking but as following your curiosity and to get to know someone new. So many people treat networking events as some sort of transactional interaction, and it’s really off-putting. Listen to people more than you speak. I think we live in a world of constant broadcasting and talking about ourselves, it’s worth remembering how important it is to properly listen to what someone’s got to say without distractions. Are there any other multi-hyphenates you look up to? Nora Ephron. Shonda Rhimes. Donald Glover. Finally, what's your best Bumble Bizz opening line? “Love your WERK!” [Laughs] But seriously, I think opening with something celebratory or complimentary is always nice.